HandKrafted by Stephanie: Sparkle Creations 3rd Anniversary Release & Hop!!! Sparkle Creations 3rd Anniversary Release & Hop!!! Hello and Welcome to the Sparkle Creations Rubber Stamps 3rd Anniversary Hop! 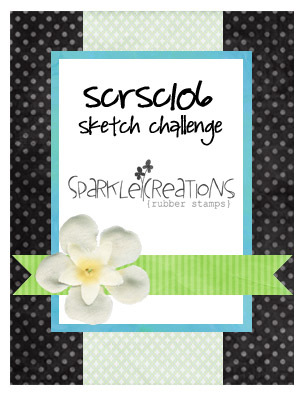 Not only are we here to help Sparkle celebrate 3 years of SCRS, but we are also officially releasing 4 new SCRS images this month -- Paris Lucy, London Charlotte, New York Josh, and Seattle Chloe. They are ALL available in the store NOW! I used Paris Lucy on my card today. I stamped, colored and fussy cut her out, then I popped her up on the cloud paper. I adapted the sketch from SCRSC106 for my layout. We have assembled an all-star lineup consisting of our Current Design Team, DT Alumni and Guest Designers. Click on all the links below to participate in our anniversary blog hop! Accessories: Die-namics Fishtail Flags Layers STAX (MFT), Markers (Copic), Sequins, Foam tape, Thread, Sewing machine. Such a lovely card! Hope you and Sabrina are enjoying the summer! So sweet Stephanie! Love her pretty ruffly dress! awesome!! the background really makes it pop!! Your papers are very chic, and so is your card, Stephanie! what a great card, Stephanie. love the touch of sequins and the pretty image you used. Love your card...super fussy cutting! Great card! Those papers are so striking with Paris Lucy!! Very cute--I like your coloring and choice of papers. This is very pretty, I love the papers you've used! So pretty! I love Maggie's Crate papers! Gorgeous card! Love the stitching around your image and the fun sentiment! Love how your papers blend! They're great!! Beautifully done! Love the fussy-cutting and the coloring of her dress! Great take on the sketch and that fussy cutting! Love the background papers and the dimension. And here's Lucy all dressed in Pink...I like it..wonderfull card. Love the card especially the night sky! Gorgeous card - love that background. Such rich colors! Gorgeous card Stephanie! Love the papers you chose and great job with the fussy cutting! So beautiful! Love the stitching!